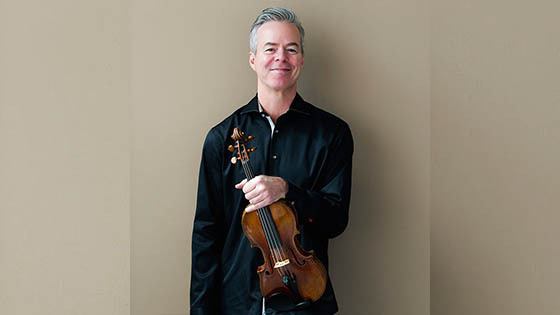 August 18, 2016, 11:39 AM · When I first spoke to Milwaukee Symphony Concertmaster Frank Almond about the 1715 "Lipinski" Strad that he has been playing since 2008, he said that it was "an honor and privilege to be passing through its life." That was before the violin and Almond were wrenched apart in a highly publicized 2014 theft, in which Almond was tased and robbed of the violin in a parking lot after a performance on a frigid January night in Milwaukee. Almond suddenly found himself in the middle of tense police investigation and at the center of a media circus. Over the course of the next nine days, police arrested the thieves and recovered the violin in good condition. Almond and the violin were brought back together and the music resumed. But certainly both lives -- the violin's and Almond's -- were changed. Before the ordeal, Almond had recorded an homage to the violin, called A Violin's Life, complete with a special educational website to tell the already-remarkable story of the 1715 "Lipinski" Strad. He had always meant to create second volume, but the incident delayed and changed his plans. This summer he released that second volume, called A Violin's Life, Vol. 2. A few weeks ago, Almond spoke to me over the phone from the Wintergreen Performing Arts Festival in Virginia, where he was teaching and performing. Frank Almond. Photo by Jennifer Brindley. Laurie: The last time we spoke was just three weeks after the theft. A lot has happened since then. How has it changed your relationship with this instrument? Frank: It's difficult to describe the scope of how much the whole thing has changed a lot of things in my life. When I spoke to you last time, I was still plowing through the season and just trying to get through what was happening. It was really important not to fold up and let this whole thing take over everything -- which could have happened. It was kind of a circus, and it was really tempting to go away, cancel everything and just go to sleep. It was also quite difficult, especially a few months later, when the guys were out on bail. There were a lot of legalities through the summer and into the fall, and it really didn't end until the following January or February. It went on a lot longer than most people realized, and I was very much involved in all of it -- I felt that it was important to be involved and not just to leave it to other people to deal with the courts, hearings and everything. I actually showed up, testified, and did all kinds of things that, before the theft, I never thought I'd need to do. So a lot of things changed. The whole routine of traveling with the violin and playing in different places -- for a while it was really strange. I don't think that any of the real authorities were concerned about anything happening. But it was in the back of everybody's mind: maybe somebody wants to try something, or thinks that (the thieves) didn't do it right, or just wants to make a scene. Of course, that would have been really dumb -- even if you're stupid enough to steal one, you'd have to be pretty ridiculously stupid to steal this one again! Frank: Yes, they wouldn't get very far. About a year after the theft, another giant article came out in Vanity Fair. It's a great piece in a lot of ways; but in another way, it kind of just churned everything up again. That's what's been interesting about the whole thing; even now, every couple of months somebody's writing about the incident. And when we finally got the disc (A Violin's Life, Volume 2) done, there was more interest. So various things have changed on a lot of levels. Happily, most of it has been positive. My relationship with the instrument -- how I treat it, what it is -- is probably amplified in a certain way. It's difficult to describe, but mostly positive. Laurie: You were doing this project -- A Violin's Life -- before that happened, you had Volume 1 out, and you had Volume 2 in the works. Did it change your approach to Volume 2 or did you pretty much go on with it as planned? Frank: It delayed it. It just wasn't possible to do what I wanted to do, with everything happening. Also, my head just wasn't where needed to be, and hadn't really settled on repertory. Looking back, I don't think I would have thought of putting Eduard Tubin's Sonata for Solo Violin on Volume 2 at the time. But the more I thought about it, there was something about that piece that fit. Laurie: What was the something that fit? Frank: It's a kind of angular, abstract. I wouldn't say it's a "dark" piece, but it's definitely got a whole set of colors and emotions that none of the other pieces on Volume 1 or Volume 2 have. It's also just a really good piece of music that nobody knows about. Laurie: I was going to say, who is Tubin? Frank: Eduard Tubin is a fascinating figure in the 20th century, and hardly anybody knows anything about him. There's a giant essay on the Violin's Life website now, but mostly he was known for a series of recordings that conductor Neeme Järvi did in the '80s and '90s of all 10 of his symphonies. This is a guy who was unbelievably prolific, and he was a really big name in the Estonian musical establishment. One of the reasons I wanted to include his piece was his connection to the last person who played the "Lipinski" Strad regularly, Evi Liivak. They were both sort of outliers, and they were both refugees from World War II. Both had to escape Estonia for one or another, either from the Germans or the Russians. Later in their lives, Evi Liivak played a lot of Tubin's works, and I believe that they were colleagues and met each other several times. But she used to play his music a lot. When I started digging around a little bit, I found that he wrote hundreds of pieces, and a lot of them are really great; definitely worth playing. Laurie: Was he actually a violinist? Frank: No, he wasn't. He was a keyboardist and pedagogue. It's a really fascinating story: he had to get out (of Estonia) because of the war, and he wound up in Sweden. He got a job and basically spent the rest of his life there. He continued to compose but he never achieved the career success that he had had in his native country -- aside from Neeme Järvi championing his works; they were quite close. Laurie: You also include a violin sonata by the female composer, Amanda Maier-Röntgen. You had a composition by her husband on the first recording. Frank: She was the first wife of Julius Röntgen, and the Röntgen family owned this violin for three generations. One of his sons Julius Röntgen Jr. played this violin in the Kneisel Quartet, and he didn't sell it until the late 1920s. The Violin Sonata in B minor by Amanda Maier-Röntgen was the piece that I stumbled on when I was looking for pieces for the first volume. I thought it was such a great piece of music, and I'd never even heard of this woman! Laurie: It's wonderful to showcase a piece by a woman composer of that era, it's rather rare. Frank: Absolutely, and she's also got quite a story. She was a multiple-talented woman who was the first woman graduate of the Stockholm Conservatory. She had quite a career as a soloist and also studied composition with Carl Reinecke. She wrote a violin concerto that was premiered at the Gewandhaus. She had a real life and a real professional career, at a time when that wasn't so common. Unfortunately that ended when she got married. It was sad also that she died in her early 40s, probably of tuberculosis. Laurie: If I wanted to play this piece, or a work by her, how would I get that music? Frank: Actually, I was stunned to find you can get it off of IMSLP. A lot of her other music though, such as the violin concerto and a few other works for violin and piano, are apparently sitting in the Stockholm National Library, where her heirs and probably some of the Röntgen family deposited her papers. So there is a lot of unpublished music. There has been more interest since we recorded this; people heard it and felt like it should get out on a real publication. So there is a movement in the works to try to get some of her music published. There is actually a recording of her violin concerto; I don't know how they found the music, it was probably a one-off thing from the manuscript. Emily Hogstad wrote the essay on Amanda Maier-Röntgen for the website for "A Violin's Life"; she already knew the piece pretty well and was excited to learn we were recording it. Laurie: I was also surprised to learn that Karol Lipinski, the violinist after whom the Strad is named, played Beethoven's "Kreutzer" Sonata with none other than Franz Liszt! Frank: Lipinski performed a Beethoven cycle in Dresden, and he played several Beethoven Sonatas over one night. One of them was the Kreutzer, and the pianist was Franz Liszt! With this violin. Of course, I couldn't get Franz Liszt, so I got Bill (pianist William Wolfram) and the Strad, and we were happy to do that. We had played it a number of times and felt like it made a good second half for "A Violin's Life, Vol. 2." Laurie: And here's a weird esoteric violin question: does your Strad like that piece? Do you feel like it grooves on certain pieces of music better than others? Frank: Well it's certainly occurred to me, but I try not to think in those terms. I would really drive myself crazy! I remember the first time I was playing Devil's Trill Sonata on that violin, and...I don't even want to go there! The people who have played that instrument -- the idea that Amanda Maier would have been very familiar with this instrument or that Lipinski played Kreutzer on it -- they're probably one of hundreds of people who played those pieces on it. Or the Chaconne, or something like that. I think that this violin likes what I like to play on it! Laurie: It is a collaboration! Frank: If I can make a case for something, then it's a high-end tool that allows you to do that. Laurie: Does it ever reject anything? People talk about having a modern instrument for certain pieces. Frank: I have to say it's been a little uncomfortable sometimes to do a couple pops shows on it...That just felt weird. Also, some modern works call for effects that aren't necessarily healthy for it. You can't hit the back or turn it upside down or wave it around. Things like that. Standard repertory, I can usually make a case for it. Frank: I was happily surprised that we were able to get this recording out as fast as we were, and I was very gratified that a lot of people jumped in again on yet another Kickstarter project for it. I've got Volume 3 rolling around in my mind but I'm not quite there yet. Things have settled down, and I've settled into how I felt about the violin before it was stolen, but probably just in a more intense way. And I look over my shoulder a lot more! August 20, 2016 at 11:17 AM · I tried to play the Maier-Röntgen video you posted and got "This video is not available". August 20, 2016 at 04:23 PM · Another good one . . .
August 21, 2016 at 11:12 PM · Wow! What a beautiful piece of music! I would like to hear more. And I would like to play it myself. How to do both??? August 22, 2016 at 03:05 PM · Check the link in the story below the video -- you can download it from IMSLP! August 25, 2016 at 03:08 AM · Thank you Laurie, certainly a good read! It does concern me however on walking with my violin everyday.